Turnigy 9Xr is modular and apparently it has better firmware than the 9X and backlit. The 9X can be modified to have same specs as 9Xr. Needs a RF module. FlySky and Orange modules are compatible. 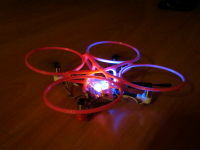 Turnigy D2811/14 brushless outrunner 1100kv, 160W (compared to 102W of the D2811/17), thrust ~650g (x4 = 2600g). Same weight and size as the D2822/17. It already has connectors, so it is a matter of plug and play according to the advertisement. The quad has been modified by others, e.g. other motors, other RX, training wheels, landing gear, one person snapped off one of the arms and made a tri-copter of it (and it still flew). The firmware might need customization. In an earlier version the motors kept spinning when on standby, and a minor change might be necessary to connect with the TX. I want to add landing gear and training wheels (rings around the motors). Update: no need for landing or training gear, the thing crashed into the door so many times without breaking anything. It will be fine. 18 January 2014: I could borrow the transmitter battery from The JinX. 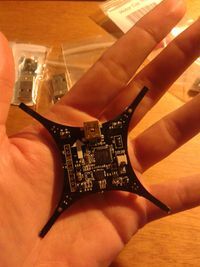 First, the pocketquad had to bind to the transmitter module. I followed the instructions in this quick step by step guide, but had some problems working through the last step; the MultiWii_2_2-gui/MultiWiiConf software. The linux version didn't recognize the device, and I couldn't properly pass on the device to a windows virtual machine. On another system with windows on it it did work. I think the wingui software doesn't scan the ACM dev's on linux. In the end it was "solved" by making a symbolic link to the USB ACM device. After setting up the transmitter "gear" switch as "aux1" (arm the device), and a quick calibration, it flew.... a little bit. It goes in all directions except the direction I want it to go, but there is movement. It does take off, after which it quickly moves forward and crashes into the door. 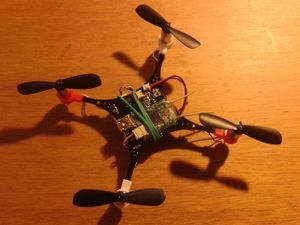 Next step will be to calibrate the quad better. 19 January 2014: Removed motors, receiver and battery. Recalibrated the quad. Assembled it again. Result: it flies much more stable now. More flying resulted in a broken propeller. Hamish designed a frame with rings around the propellers. Result: it barely lifts off (too heavy)... and a broken frame (the printed one, not the main frame) after flying with it. 23 January 2014: I got very useful tips from phicoh. The quad calibrates on start-up, so you should balance the quad while connecting the battery. Furthermore the expo levels for ELE and AIL were set to 20. These settings helped to make the right stick of the transmitter react slower, which makes the quad less jumpy. Need to have a look at the rudder settings next, since that is not reacting very well. For several items you get a buddy price code at hobbyking, which means discount for the person who is going to order the same item and a discount for the person who has passed on the code. Mail your fellow techinc-ers for this code if you want to order the same item(s) as them. Flying is allowed in 'class G' airspace. In most places, airspace from the ground to 300m is class G. The main exception is the area around airports. Unfortunately, almost all of Amsterdam falls into the CTR of Schiphol. So flying is not allowed. However, some of the model flying clubs managed to get an agreement with air traffic control to fly on some fields that are inside the Schiphol CTR. Special care must be taken in areas where military aircraft are allow to fly low. See  (Dutch). They fly very fast and low so you have to have somebody to watch out for them. This page was last edited on 29 May 2014, at 01:02.